Indian Single Malt Whisky Story - Paul John, Goa. We don’t believe in competition, we believe in conquests. The sheer beauty of mastering a bodily existence of flavours, aroma and spices is carefully intertwined into a tapestry called The Great Indian Single Malt, which awakens the innate Indian in you. Hailing from the land of empire to independence, Mr. Paul P John was caught between the rugged coast of Scotland and the various hues of India. Furtively charting his way through the lanes of Scotland and investigating on distillation and the country’s whisky culture , it occurred to him to embrace and yield a single malt made in India not just for the Indians to relish but for the whole world to experience-‘The Great Indian Single Malt’. Established in 1992, John Distilleries grew to be a leading spirit company within less than a decade. Its creation ‘Paul John Single Malts’ were launched in the UK in 2012, which were soon laureled by single malt enthusiasts around the world. Majestically towering its way through the world market, The Great Indian Single Malts has been crowned with innumerable global awards further proving our excellence. This recognition from the single malt palate has encouraged us to unfurl this tricolored aroma of our single malts across different continents. Within the inestimable mysteries of these liquid sunshine, lies the veracity of The Great Indian Single Malts. Marching along with his combatants with head held high wasn’t a tranquil passage. 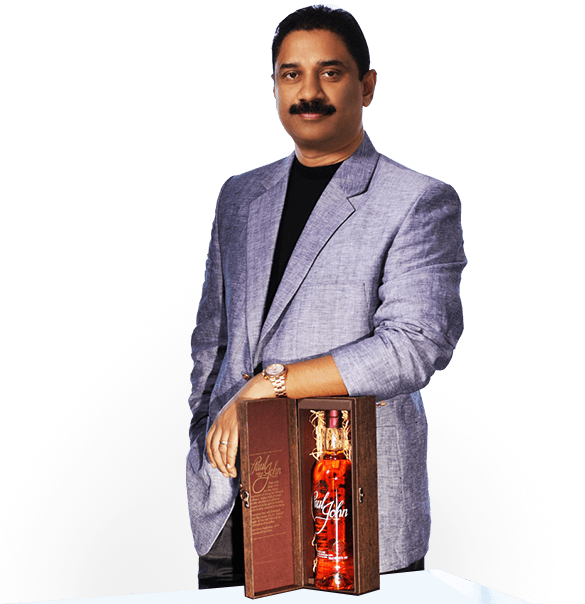 Mr. Paul P John, Chairman of JDL, wanted to create an Indian Single Malt which would embrace all the emotions and indigenous ingredients. Guided by his singular passion, tomes of wisdom and the extraordinary skill of his Master Distiller Michael D’Souza; they had set forth on the journey to create the multiplicities of the marvels. With each sip, you must be engulfed with the fervor and expressions of Great India. Paul P John ventured into the alcohol beverage industry in 1992 and within a short span of just over a decade, his reach spread from his headquarters in Bangalore, Karnataka expanded to all neighboring states. Today the Company is the 4th largest liquor company in the country. His zeal to surpass the ordinary led him to create a range of exceptional single malts, fine whiskies & wines. We use six row barley that is sourced from foothills of Himalayas. Due to high fiber and protein content, The six row barley offers a distinct tannic character to the spirit. This leads to a very fruity whiskey, which, besides a honey sauce, also has floral notes. In combination with a very short maturity - thanks to the high temperatures and the high humidity in Goa the whiskey matures faster - the Paul John whiskeys are very creamy. One of the major reasons to why we have such a bold character, is there a lot more proteins in it, and tannins, and as a result, there is a lot of fatty acids that add to the character. Goa was specially chosen as the home of our single malts, not just for its unique micro-climate but also because the destination holds a special place in Mr Paul’s heart. Having always enjoyed the beaches, food and the warmth of its people, Goa was but the perfect choice to set up the malt plant. Distilled and matured in Goa, India, Mr. Paul John picked the area for the perfect climate to produce whiskey the way he wanted. The water source is 100% from Goa. We’ve got a fantastic water table. We have lots of rivers that pass through Goa, and they are all extremely very good quality. Copper pot-stills made in India, were specially designed with long necks to create fruitier spirits. Double-distillation in these pot-stills prolong intimate contact with the copper and this renders a distinct, rich and full-bodied flavour to the new-make spirit. Paul John has a single set of pot stills.The wash spirit still has 12,000 liters capacity and the spirit still handles 6,000 liters and both are steam heated. The stills have been custom made in India at Gujarat.. There are two warehouses. The underground warehouse has a capacity of 4,000 casks with comfortable temperature and is less humid. The upper warehouse which is at ground level houses about 6000 casks and is much warmer. The distillery also buys used bourbon barrels from the United States to age their new make spirit. Goa’s tropical climate increases the rate at which Paul John whisky matures. This is not surprising, because high temperatures are thought to accelerate the formation of certain flavours in whisky as the whisky matures in oak barrels. A whisky will develop a different composition of flavours at different temperatures, so Indian single malt whisky will be its own unique configuration of flavours. Currently we are producing about seven or eight varieties. It starts off with the 46% (ABV), non-chill filtered called the “Brilliance”, then “Edited”, and “Bold”. “Brilliance” is a completely non-peated whisky. “Edited” is with a little bit or hint of peat, and the third is called “Bold”, which is a peated whisky. Now here, everything is completely made in India, except in the case of peat; we are importing peat from Scotland, and peating the Indian barley with the Scottish peat. Right now we haven’t discovered peat in India, so for now I depend on Scotland for the peat. We have two at a little higher strength called the “Classic” and the “Peated,” which is 55 and 57.5% (ABV).